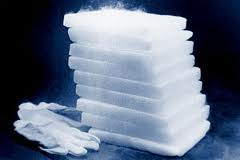 So last week on my way to sign paperwork for a new job, I drove by the grocery store that, in late fall of 2009, had dry ice in stock when I called every place in town trying to find it. It seems a little surreal that I actually did that, you know, plan my death down to the last morbid detail of calculating how many dry ice packs would be required to preserve my body X amount of days so that it wouldn’t be AS awful when somebody found it. As a courtesy (I feel), you should do that. You should know what day you’re going to eat last, so that you can know there won’t be anything inside you. And for Christ’s sake, you shouldn’t be found naked. A week prior I had to get an I-9 notarized, which triggered a 2009 flashback to my “witness” questioning me admirably for being so responsible as to write a will at my young age. Standing outside the notary public in Austin’s blazing July heat chatting with this stranger, I *knew* she wanted to know the dirt…does this chick have cancer? She looks fine to me. What in the world does a 27 year old need a will for? Two weeks before that I was packing boxes to move and came across the shard of glass from a broken mirror, two packs of powdered aspirin, and the stashes of pills I still have stockpiled for some reason. What, really, would be a good reason to hold onto your means and your backup plans for your backup plan? Luckily I’m not in therapy so I don’t have to answer that. Sadly, I’ve never been to a counselor-psychologist-psychiatrist with the depth or skills to even GET to a question like that. Even the people who are supposedly TRAINED to “go there” can’t actually do it, because it’s safer to talk about why you don’t have a job or how your family’s so screwed up. But I digress. My first suicide plan back in 2007 (link) was too hasty to encompass such minute details. It was thrown together in half a day. The second and third time around, the plan evolved to be more exhaustive. I mulled over the minutiae laboriously as my cash ran out and an upcoming eviction notice loomed over me. With the same furor I usually summoned to plan my life, I instead planned my death. I reveled in having something to focus on besides the aching hole terrorizing my insides. I stopped short of buying dry ice on my step-by-step plan, and still to this day have never stepped foot inside that particular store … have never even laid eyes on the place until the other day. Life sprinkles all these coincidental little reminders in periodically to ensure you can’t escape from the memory of almost. Almost not here. Once you’ve been suicidal, you can’t not be the person who went off the deep end. You don’t get to be the stable, rational one with a good head on your shoulders anymore. 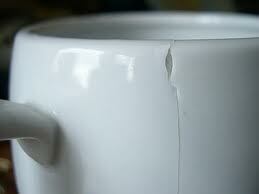 People view you as the equivalent of the hairline fracture in their coffee mug; for the most part you’re functional and they can sometimes hide the imperfection, but every once in a while the leak betrays itself and they’re never quite sure when you’re gonna up and crack bigtime. And to be honest, I feel the same way about myself. Even if you glued me or something, I’m still convinced I could bust open at any given moment. I remember Rappaport’s proposal from In Her Wake that people plan suicide as a way to cope with life. 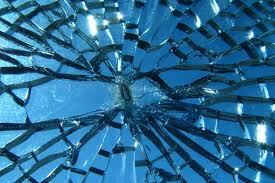 If you perceive your situation as inescapable, you are trapped. There is a perverse comfort you indulge in by planning your way out. “If this gets to be too much, I enact the plan,” you tell yourself. “If I can’t take it anymore, I know how to make the pain stop.” (This is my grotesque version of paraphrasing a book I read almost three years ago). Though a year’s gone by since my last serious inclination towards suicide, I think Rappaport might understand better than I why I still harbor the means to my demise. Not a day goes by that I can’t find a book or soup ladle or other random possession I’ve forgotten I got rid of that summer in Austin. Sometimes I think parts of myself were discarded along with my belongings, and I’m not allowed to forget it. That's actually pretty considerate, thinking of the dry ice. I never would have thought of that...I have a feeling most people wouldn't. The will thing is also interesting because when I've been depressed, I could care less who got what if I died. Being unemployed and alone most of the time gives one endless time to think of all those things. I think the suicidal state is also more active than the depressive state. I'm also consumed with "not being a burden" to anyone, which is reflected in my day-to-day life doormat syndrome of always doing for others, and having difficulty with others taking care of me. how are you? the new job? I'm missing reading your posts. it HAS been a while; i'll post soon. there've been ups and downs, a lot of anxiety to cope with, but i have felt more like "myself" recently than any other time in the last 4 1/2 years. btw, i've been meaning to thank you (so much!) for recommending Somatics; it's brought me more relief for my hip than anything else. i do a handful of exercises almost daily. to have some days where i'm not in pain, nights when i can sleep...priceless. where was this damn book 4 years ago?!!! thanks colleen. You're more thoughtful than I am (screw them all for not giving a crap when I was alive would be my attitude) - I would really only be concerned with making sure my cat isn't in any danger from my absence. He is after all the only one who cares even when I'm a downer (he becomes more affectionate and cuddly than his usual energetic and independent self when I'm too depressed to get out of bed). That sounds unhealthy, but a cat is better than nothing, and less fickle and selfish than most humans (Yeah, I just said humans are generally more selfish than cats). People highly underestimate the bond of a pet...plenty of humans leave, are nowhere to be found when you need them. But somehow to look at that little face and imagine it missing its favorite human, or to think your beloved little fuzzball would end up in the wrong hands...at least can give one a reason to live sometimes. Has for me plenty of times.